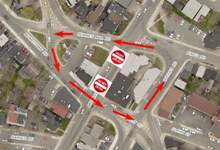 The City is piloting traffic modifications at Rawlins Cross to reduce delay and improve safety. During the coming weeks the City will be making minor changes in the area such as new pavement markings and new signage that will be temporarily bagged. This preparation work will not impact current traffic flow in the area. The official date of the changeover to the new traffic circulation will be announced in the coming weeks. A traffic advisory will be posted on the city’s website before the official change, sign up for e-updates. The Rawlins Cross pilot project will remove two traffic signals on Military Road and introduce a yield-on-entry system. Changes will remain in place until evaluation is completed by staff and a report presented to City Council who will vote on whether the traffic changes will be permanent. For further information about the Rawlins Cross pilot project please view the informational video online, or visit engagestjohns.ca.